Coordinate small extras with your existing black and gold palette. 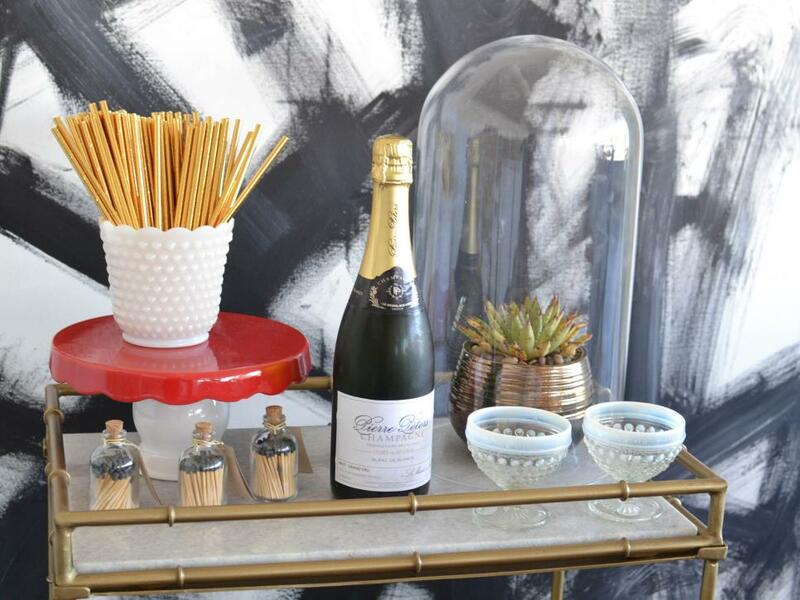 Interior designer Jade Joyner, co-owner of Metal + Petal in Athens, Ga., placed matches with black tips into small apothecary jars, and arranged them on a gold bar cart. She selected other entertaining essentials, such as straws, in gold as well. Even the champagne bottle’s gold seal fits into the look, and pops against the black and white modern art backdrop. 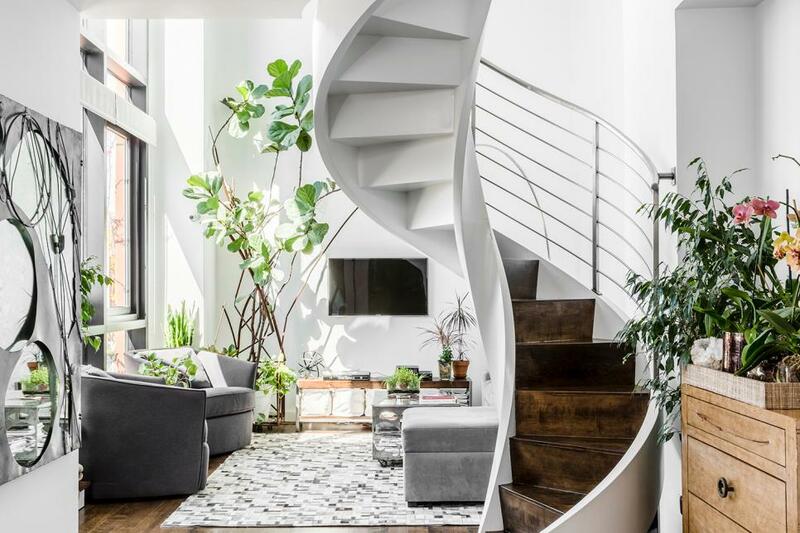 This light and bright living room features a custom white spiral staircase at its center, complete with a metal railing and brown stairs. Several potted plants and trees throughout the space add a bit of natural decor, while plush gray armchairs with a matching ottoman provide a cozy place to relax. Commit to the black and gold scheme in a major way with artwork, wallpaper or a quick update to your wall color. 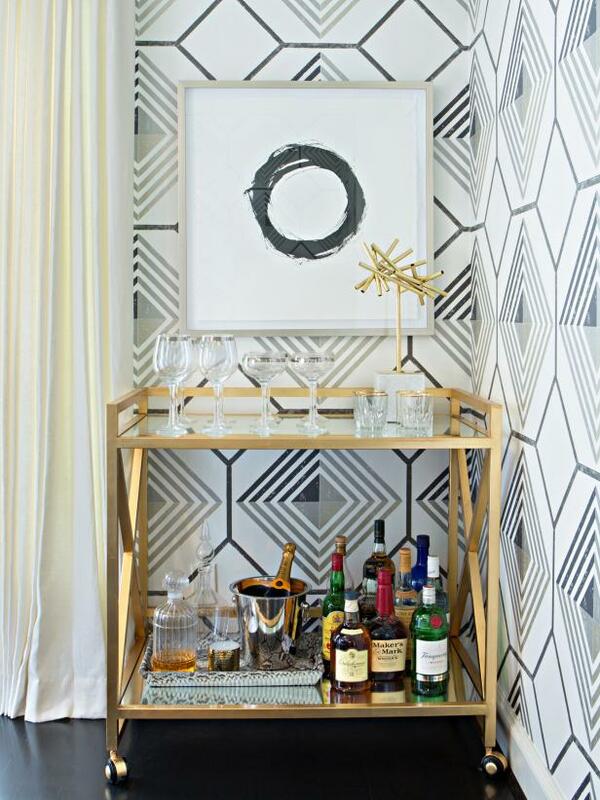 Then look for color-coordinated straws, like these black and gold ones that interior designer Jade Joyner, co-owner of Metal + Petal in Athens, Ga., used on her bar cart. Even with a black and gold palette, you can incorporate other colors. Joyner says she loves how refreshments have an element of style to them. In the entry of the home, designers chose to use colors that would acclimate guests to the home's bold metallic and contrasting neutral color palette. 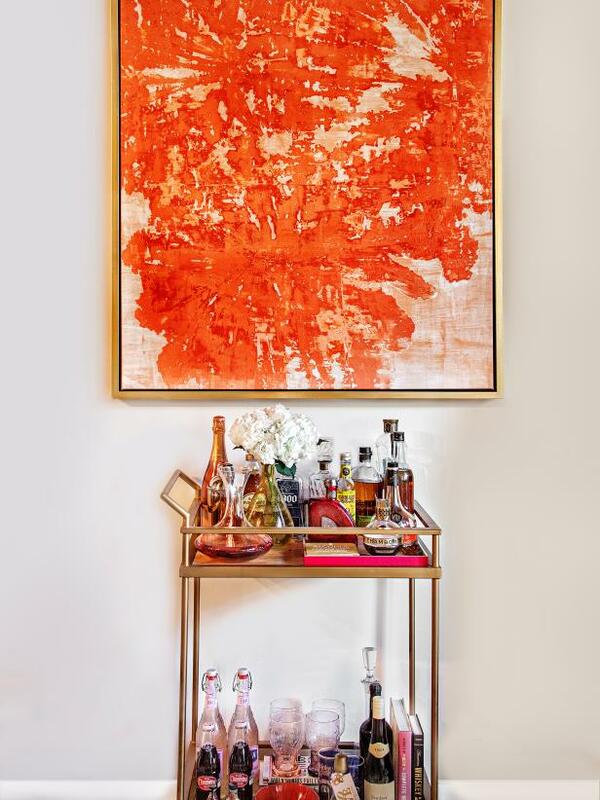 The artwork does exactly that, adding glam to the space without detracting from the apartment's beautiful views. 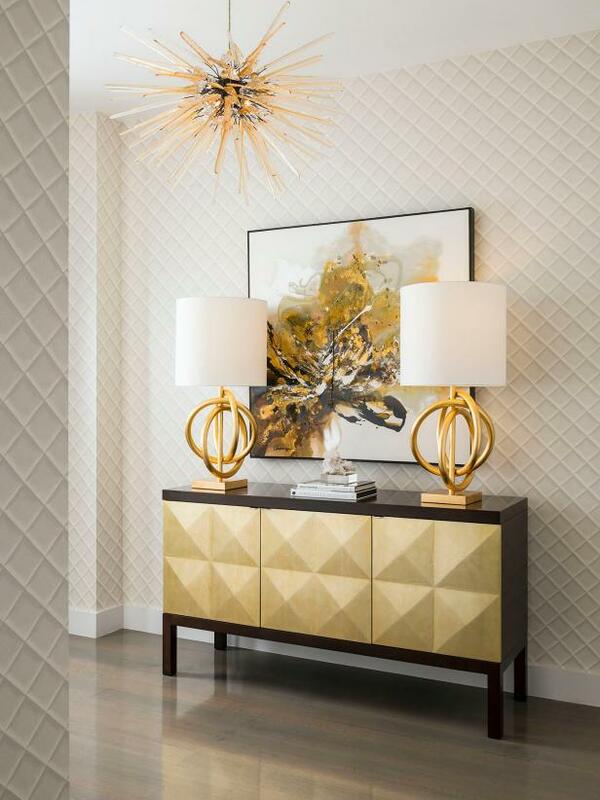 Patterned wallpaper with a three-dimensional quilted effect was selected to envelop the space, while large scale, gold-leaf lamps sit on a console which emulates the wallpaper patter. To finish the space, designers hung a glass, Rod Sputnik chandelier for a spectacular statement upon entering the home. 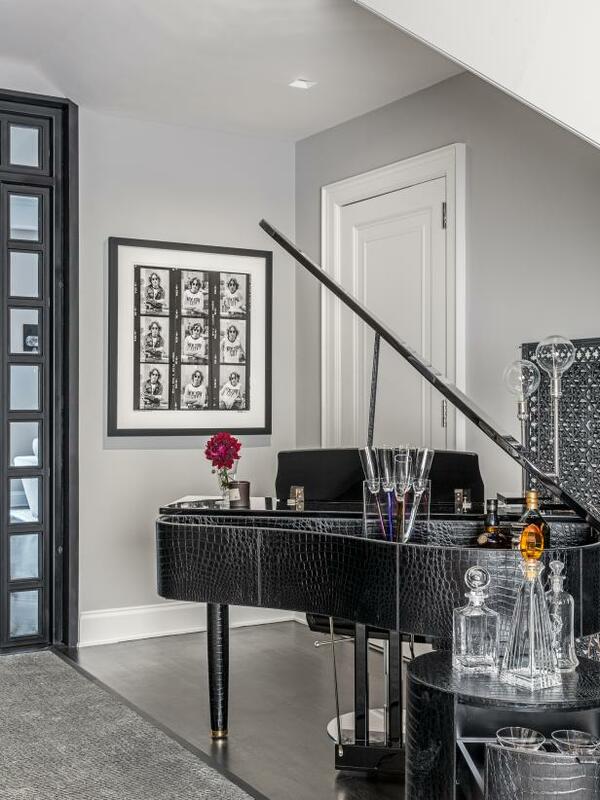 This music room serves up sonatas and cocktails in glamorous Art Deco style, from the black alligator-clad piano to the black-and-silver bar cart. 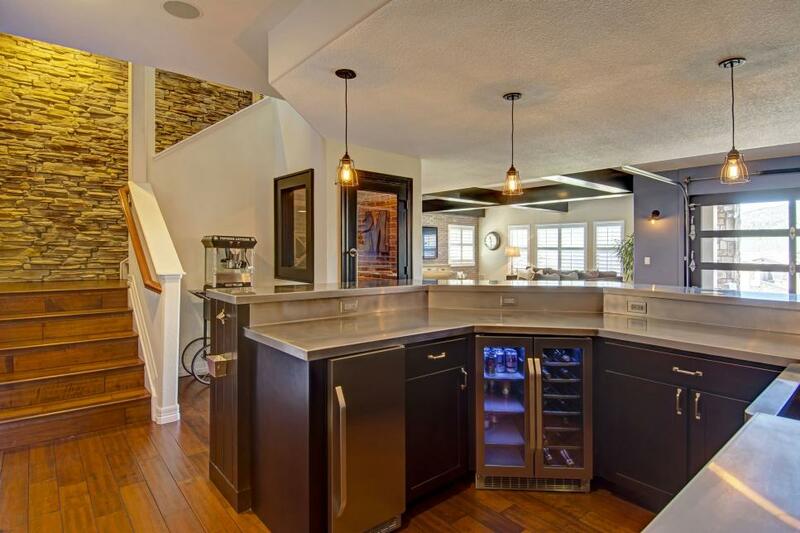 This spacious basement was renovated to include a wet bar with industrial pendant lighting and a stainless steel countertop. The nearby staircase features a stone covered accent wall and hardwood steps. 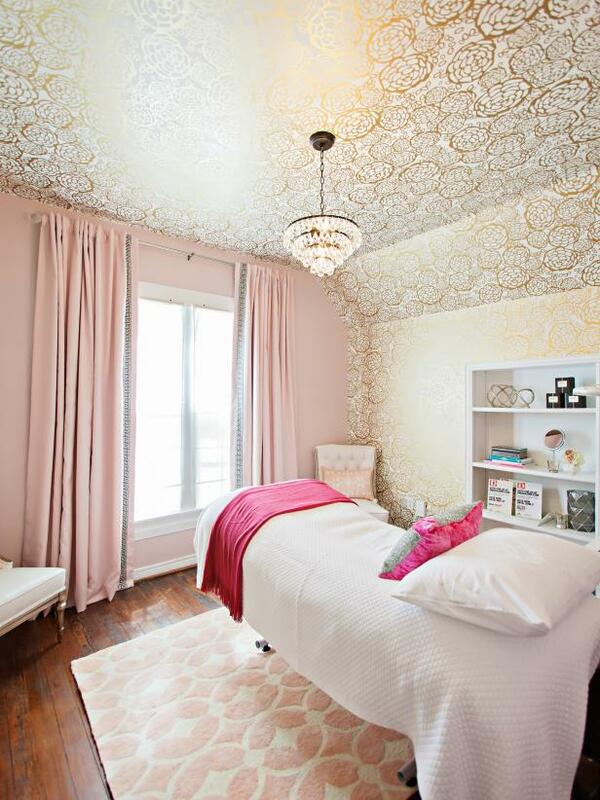 Step into the lash studio's treatment rooms and instantly feel pampered with the luxe gold wallpaper, plush rug and rich fabric for the curtains. 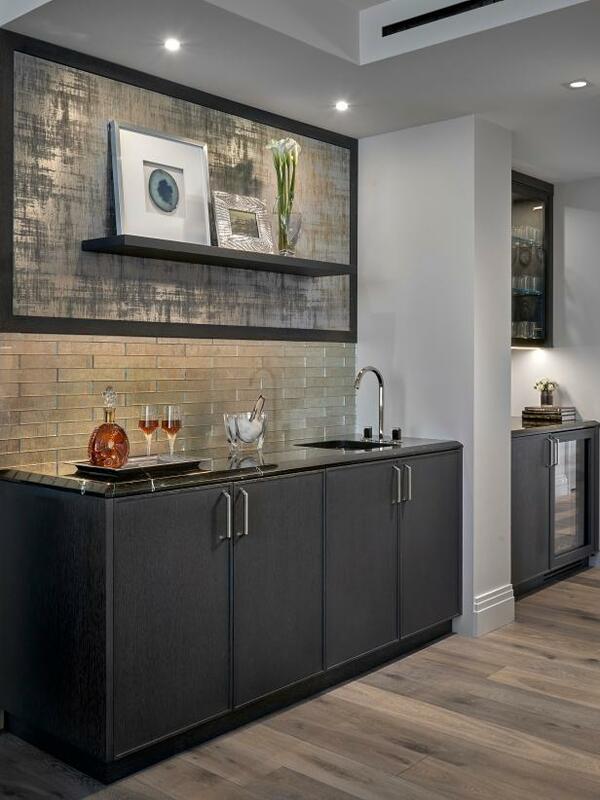 This modern wet bar has an upholstered accent wall and metallic glass backsplash, modern dark stained cabinets, sink with contemporary faucet, glass front cabinet storage, and a refrigerator for wine, beer, and drinks. 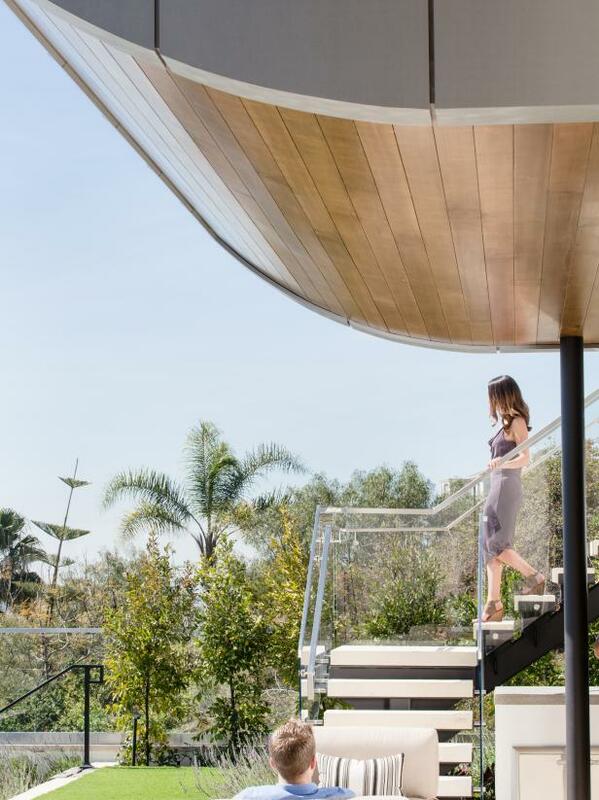 This stunning backyard features a contemporary staircase with neutral stone stairs, and a metal and glass panel railing. A seat under the covered porch offers a view of the tropical landscape. 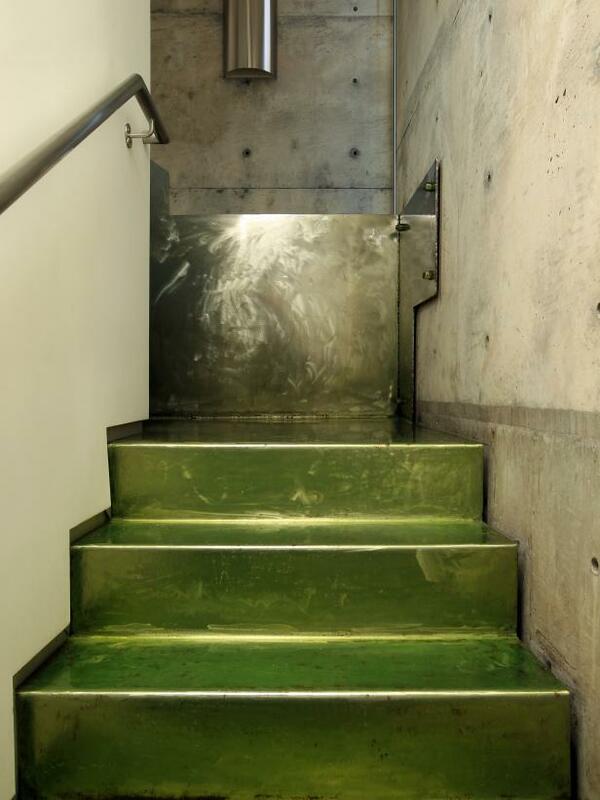 For a little bit of flash going up the stairs, designers created walls out of scored concrete. Then, they installed a metallic flooring that would reflect light and help brighten up the heavy, darker space with a bit of pizzaz. Built-in shelving adds storage and display space; the crisp white is a refreshing contrast to all the gold and pink. 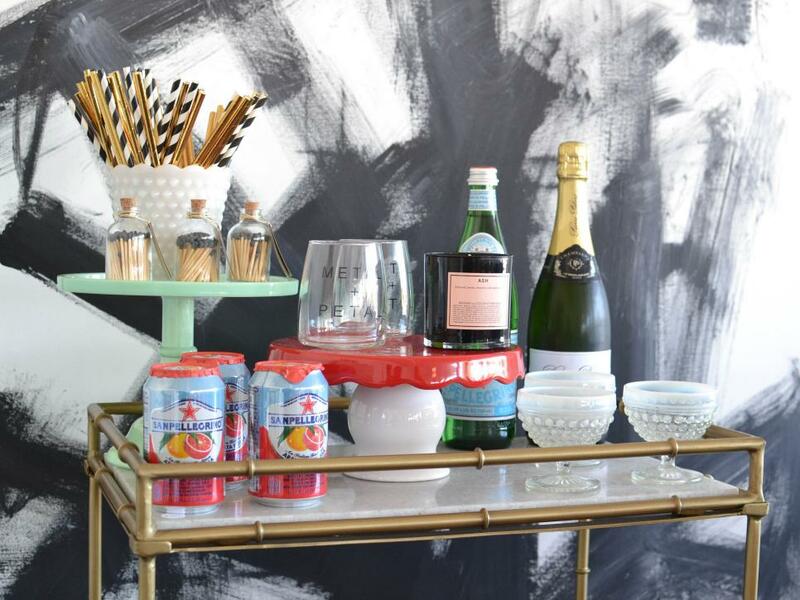 Entertaining is made easy with this rolling bar cart. The stylish piece fits perfectly in the corner when not in use. 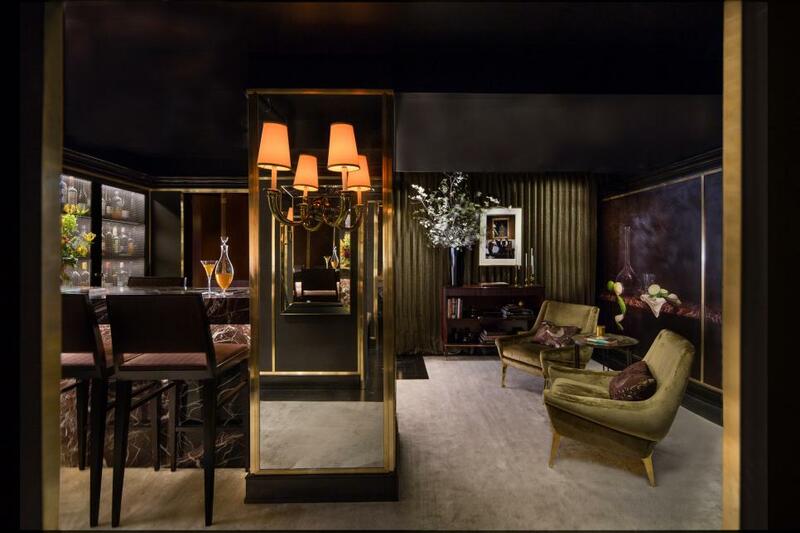 With dark, moody interiors and brassy finishes, Lichten Craig Architecture + Interiors transformed this windowless room at the 2017 Kips Bay Decorator Show House into a speakeasy-style bar and lounge. 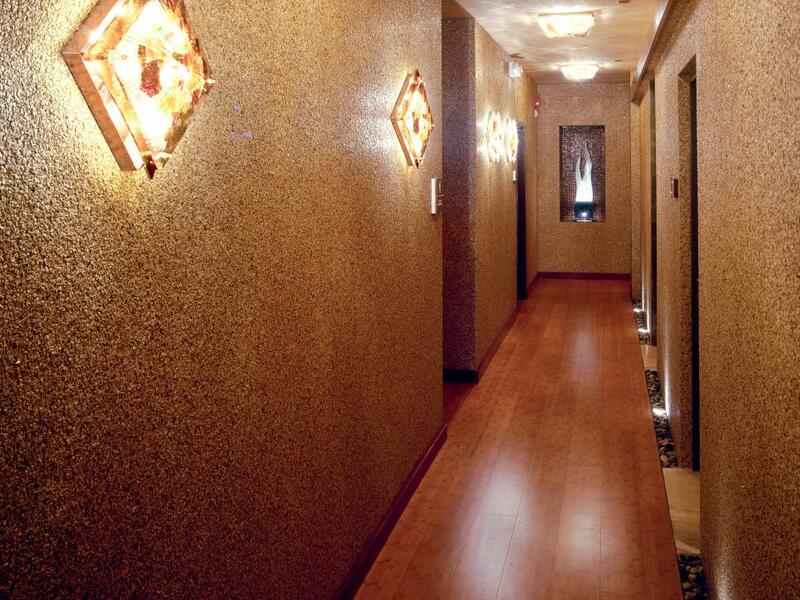 This hallway received the gold treatment with sparkling granite wallcoverings. Italian glass, polished river rock and onyx accents add to the lush look. Design by Shelly Riehl-David. 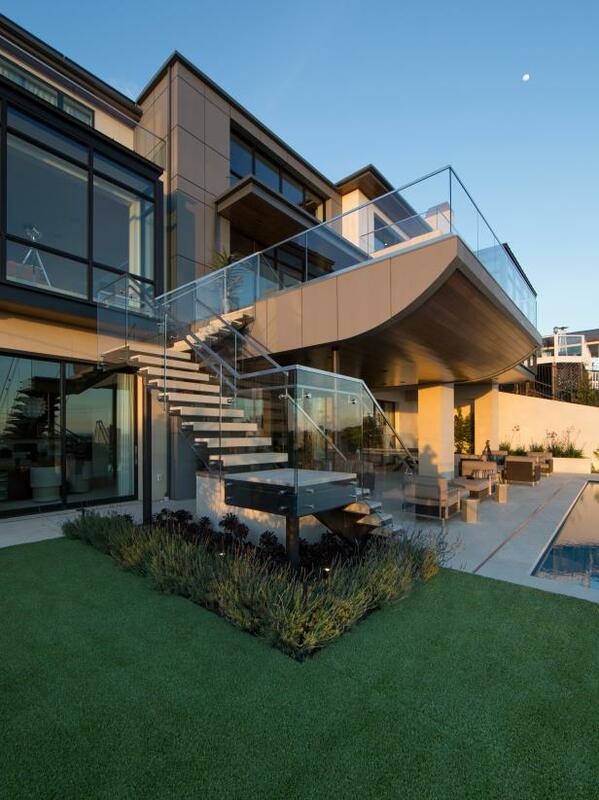 This sleek backyard staircase features a metal railing and glass panels that lead the way to the upstairs areas. A small patch of grass adds a pop of natural color. Mini refrigerators are useful, but they aren't all that attractive. 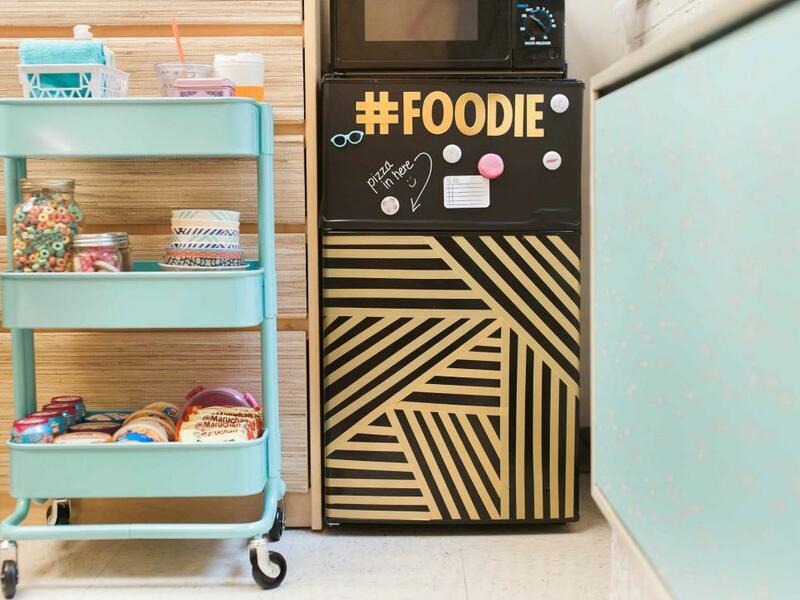 Personalize your dorm room refrigerator using strips of washi tape. We created an abstract stripe design with metallic gold tape. Chalkboard adhesive over the freezer allows you to further personalize the appliance. A light turquoise stacked shelf creates a cute and useful pantry for food and kitchen accessory storage. 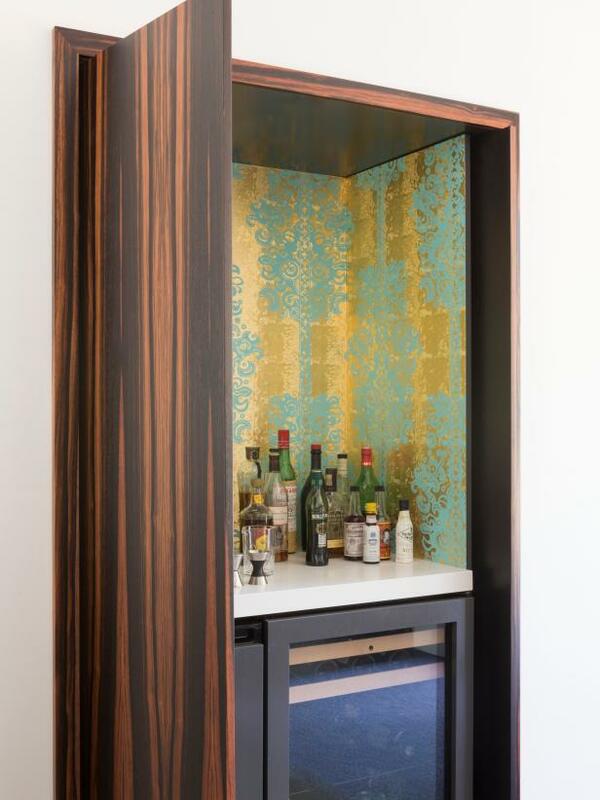 A wood cabinet becomes a dynamic bar area with the addition of gold-flecked wallpaper and a small refrigerator.